We all try to live as healthy as we can, often giving too much attention to fad diets or dieting crazes that leave as quickly as they came in. There’s no substitute for a well balanced diet and a regiment of exercise. The body needs these things in order to stay as fit as possible and help prolong your life but many people don’t realize that also having a pet is sometimes the best medicine for those wanting to live a healthy lifestyle. Here are just a few of the benefits of having or adopting an animal. 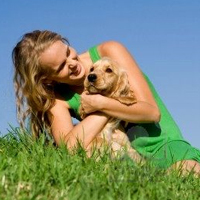 Just for starters having a pet can go a long way towards improving your mood. You might not think that this is that big of a deal but if you find yourself constantly in a bad mood or suffering from depression, a pet can really lift your spirits. Now that’s not to say that a pet should be used as a substitute for depression medication but the two used in conjunction can be just the right touch. If people feel that their mood is altered by their pet it can help reduce stress levels and keep a person feeling much better. Mental health is just as important as physical health. While medicine can help regulate your blood pressure, it also puts a lot of chemicals into your body that can often have negative side effects. Most are already familiar with the commercials where the list of side affects that take longer to list than the advertisement itself. A recent study put out by Newswise talked about how having pets can be more calming and more effective at controlling blood pressure than some medications. Having pets has show that people are likely to become more social are usually have a stronger drive to get out and exercise. Sometimes this isn’t out of choice but out of necessity. Pets, especially dogs, need a certain amount of exercise and there’s nothing better than taking a walk with your dog. Adding more exercise in your routine will help your waste line, stress management, and overall health. Our pets do a lot more for us than we realize and perhaps that’s the reason why so many consider cat or dog adoption as such a great choice. Owning a pet isn’t for everyone and there are many people out there who don’t have pets and live a very healthy and productive lifestyle. Pets also come with a lot of additional work and responsibilities that some people might not find desirable. People shouldn’t get a pet just for the health benefits but if someone is thinking about adopting an animal then there are some added benefits that they might not have been aware of.